China's State Council, or Cabinet, on Monday publicized a circular on soil pollution that sets out a plan to contain the increasingly severe problem by 2015. The circular ordered a thorough survey into soil conditions be conducted by 2015 and a system be established to rigorously protect arable land and land where drinking water originates. It proposed building a soil environment monitoring network to cover 60 percent of all arable land and land of drinking water sources that serve over 500,000 people, so that regular surveillance will be possible for these regions. Rigorous controls on newly polluted soil were also demanded by the State Council, which set soil protection priorities as nipping in the bud the environmental risks accompanying soil pollution, and treating contaminated land. China is facing a grave situation in soil pollution, with a problems including expanding arable land affected by pesticides and chemical fertilizers, severe pollution by heavy metals, and pollution at mine and factory sites, Zhou Yikai, chairman of the Hubei Provincial Committee of the Chinese Peasants and Workers Democratic Party, said at the 2012 session of the Chinese People's Political Consultative Conference National Committee. 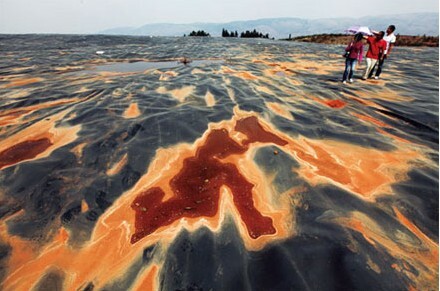 For heavy metal pollution alone, the pollution results in the loss of 10 million metric tons of grain and the contamination of another 12 million metric tons annually, incurring 20 billion yuan in direct economic losses each year, the Ministry of Land and Resources estimated.